As of September, the Town of Blackfalds is now officially the only place in Canada sporting an indoor leg of the Trans Canada Trail. 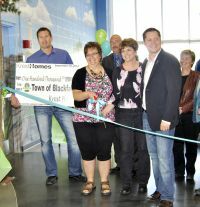 Sean Barnes, community services director, said with the town already so proud of the highly successful Abbey Centre, making history with the first indoor installment of the trail is yet another achievement Blackfalds can celebrate. "It's history in the making to be honest," Barnes said. "Not only are we the only place in the entire country that has an indoor leg of the Trans Canada Trail, but it's also another connection between our communities." A ribbon cutting, cake and a round of celebratory speeches constituted the festivities during the grand opening of the trail in the Abbey Centre earlier this month, along with a visit from representatives from Alberta TrailNet, Trans Canada Trail and the Central Alberta Regional Trail Society. Barnes said the event was important for spreading awareness about the opening of the trail, but was also a way to congratulate the town's efforts in linking together surrounding communities like Lacombe and Red Deer. "If we take a look at this past summer, we have BOLT transportation going on and now we're joining ourselves up with a trail," Barnes added. "I'm glad we have that connection between our communities, and I think that shows good collaboration within the municipalities." With new signage put up along the outdoor portion of the trail, walkers and runners can head straight through the Abbey Centre's glass doors and travel through the facility using the new leg of the trail. While the indoor portion does maintain the same hours of operation as the Abbey Centre, the trail will be a nice reprieve from the cold winter weather coming up. The only indoor portion of the Trans Canada Trail, which goes through the Abbey Centre, officially opened Friday with a ribbon cutting ceremony. "Blackfalds is a very active, very dynamic community," said Ross Hayes from Alberta Trail Net. "It's wonderful to see this community lead by example." The trail connects Blackfalds to Red Deer and Lacombe and winds through the second level of the Abbey Centre. 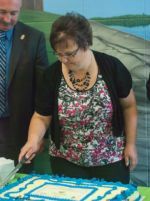 "Blackfalds vision to construct the Trans Canada Trail in the Abbey Centre is truly unique," said Paula Law, Lacombe County Reeve. Darcy Stengel, MC for the event, commended Blackfalds for putting the trail through the recreational facility. "The Abbey Centre is the crown jewel of Central Alberta," he said. Lacombe-Ponoka MLA Rod Fox said the trail is "an important part of tourism and recreation in Central Alberta and free to use." The idea of a regional trail network in Central Alberta can be traced back to about 1987 when Red Deer's Waskasoo Park was developed, according to Central Alberta Trail Society (CARTS) president Paul Pettypiece. 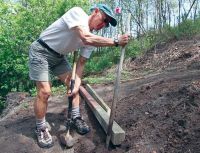 Soon, trails starting sprouting up in Innisfail, Lacombe, Sylvan Lake, Bentley and Gull Lake. In about 1992-94 the Trans Canada Trail started, to commemorate the country's 125th birthdahy. Then in 1994 a group of people, with help from TrailNet, pushed for the Red Deer trail to be linked to Sylvan Lake by using an abandoned Canadian Pacific Railway. In 1998, in Central Alberta, residents from Red Deer, Red Deer County, Parkland Community Planning Services, Alberta TrailNet, Red Deer Visitor and Convention Bureau, Normandeau Cultural and Natural History Society and Red Deer River Naturalists joined together to form the Central Alberta Regional Trails Initiative. Their aim was to develop recreational trails linking rural Central Alberta. The region they first identified included Innisfail, Red Deer River, north along the river, Alix, Tees, Clive, Lacombe, Bentley and Sylvan Lake. Other communities wanted to be part of the initiative, including Bowden , Elnora, Mirror, College Heights, Markerville, Dickson and Benalto. In 1999 they formed the Central Alberta Regional Trails Society, a not-for-profit society run by volunteers. The counties of Red Deer, Lacombe and Ponoka also took an active role in trail planning to link communities in their jurisdictions. 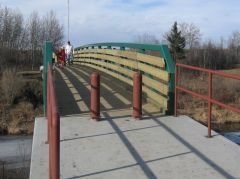 Two pedestrian bridges were built in 2010 by the military, one over the Blindman River near Blackfalds and the second across the Battle River near Ponoka. Ponoka has an equestrian portion between Ponoka and Lacombe County boundaries. "Regional collaboration is alive and well in Central Alberta," said Lacombe Mayor Steve Christie. Likewise, Debbie Olsen past CARTS president said, "When communities work together exciting things can happen." At first landowners were resistant said Blackfalds Mayor Melodie Stol but she added that now they are coming forward to participate. Mayor Stol commended the Kuhnen family in particular for their involvement locally. "I was pleased with them as they were very easy and willing to work with the town during the process to purchase land to route the trail from Range Road 40-0 into the Aurora Heights subdivision," said Mayor Stol. "It was nice to be able to work with the landowner who saw the overall community benefit of the project and negotiate with the town fairly." Sean Barnes, director of community services, said the Kuhnen family are avid trail enthusiasts and believed in the Trans Canada Trail going through their land. Mayor Stol also thanked all the corporate sponsors. Krest Homes presented a $100,000 cheque to the town for the trails on Friday. "Krest Homes has been involved with the community of Blackfalds for the past two years working very closely with the town and residents within Blackfalds and our business is thriving in Blackfalds as it grows and it is always nice for Krest Homes to have an opportunity to give back to the community and be part of the Trans Canada system," said Kevin Lapp, COO of Krest Homes. "It's very unique. It's the only indoor portion but it really comes down to us being involved in the community and wanting to give back." The Trans Canada Trail is the world's longest recreational trail and connects Canada from coast to coast. Another local link to the Trans Canada Trail has been completed. On Sept. 19th, trail lovers and dignitaries gathered at the Abbey Centre to officially open the latest link of the Trans Canada Trail at the Abbey Centre in Blackfalds, the only indoor link of the nation-wide trail in the country. This new link completes the trails connecting Blackfalds to Lacombe and Red Deer and as former Central Alberta Regional Trails Society (CARTS) President Debbie Olsen commented, will eventually connect to the entire nation. "Eventually, it will connect Central Albertans with the rest of the country as well," said Olsen. "So it really is an exciting thing." Current CARTS President Paul Pettypiece agreed. "It is indeed a pleasure to be here today to see this exciting development come to fruition and have this grand opening," said Pettypiece. In addition to Olsen and Pettypiece, several other dignitaries made addresses at the opening, including MLA Rod Fox, Lacombe Mayor Steve Christie, Lacombe County Reeve Paula Law and of course Blackfalds Mayor Melodie Stol. Many of the speakers commented on the uniqueness of the trail with Fox commenting that the indoor link was the only one in the country. Other speakers like Law commented on the strong partnerships that made the trail link a reality. "This connectivity highlights how much each community works together with its neighbours to develop one continuous trail," said Law. "Lacombe County is proud to be a neighbour of Blackfalds and this trail is one example of our continuous partnership of working together to achieve a common goal." Christie had similar feelings to express. "This trail supplies and provides yet another connection between our communities that regional collaboration is alive and well right here in Central Alberta." During Stol's address, she revealed that a sponsor for the Trans Canada Trail link at the Abbey Centre had been found with Krest Homes stepping up to donate $100,000 to the Town of Blackfalds. "I get to announce something very special today," said Stol. "I'm just so thrilled today to announce that sponsorship has come forward." After the speeches there was a ribbon cutting ceremony where the trail was declared officially open followed by a cake cutting and celebratory luncheon. Following the formal program, Law, Christie and Stol continued to speak of how important regional partnerships and collaboration were to the completion of this project. "I don't think you can do anything like this on your own," said Stol. Law agreed. "You know, we can all choose to do things individually," said Law. "But we can do bigger and better and greater things if we choose to work with partnership and cooperation and this is a prime example of it." Christie said what's also important is recognition of the user-ship and the advantages of having something like this in their communities. "User-ship from not only our own communities but bringing people from other communities into our region is very, very important to us so if we can work together to make that happen it just works out great." Nestled behind a hill northeast of the Abbey Centre along the Trans Canada Trail sits a magnificent $225,000 amphitheatre, almost hidden. Many people don't know it's there but the stone arc that seats 250 will soon host Blackfalds fun events. "This is just another awesome amenity that people in our community get to use," said Sean Barnes, director of community services for the town. "It's for children's plays, future music festivals, concerts, Blackfalds Days, Winterfest and other events," he added. Construction on the Blackfalds District Ag Society Amphitheatre started in June and it was finished in August. The inaugural event for the facility will be the Penguin Dip held on Family Day in February. "Everyone can sit on the rocks and watch that," said Barnes. 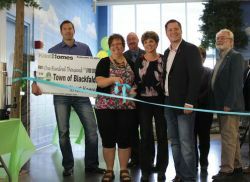 This facility is just another example of Blackfalds continuing to lead the pack for facilities in Central Alberta. "It's another feather in our cap of adding something that no one else has," said Barnes. "Here we have the great Abbey Centre and everyone is mesmerized by how beautiful that is, and then we have the Trans Canada Trail that goes through the facility, and we have the Trans Canada Trail that links up the three municipalities and now we have the amphitheatre. Not too many communities can say they have that." Electricity is hooked up for sound and lights for plays. Some finishing touches remain such as building a shelter over the amphitheatre next year. A trail leading to it will be constructed and a laneway with a gate installed. The amphitheatre -- and many other recreational amenities in town -- is the result of a forward-thinking town council and town administration, said Barnes. "We have such a progressive administration, (recreation) board, and council. It's not like it's a ton of money but when you do stuff like that it means a lot to the community. "The community will enjoy it for years to come," he added. The town -- ranked as one of Canada's fastest growing communities -- has experienced swift and incredible growth over the last few years and providing residents with relevant recreational facilities is part of keeping up with that growth. "We're doing a lot of stuff in the community for sure in regards to recreation, parks, developing new playgrounds, trails, the amphitheatre and Abbey Centre, and it's just going to go on. "It's so cool to work here (Town of Blackfalds), it's exciting, we're growing so fast and we are trying to keep up with the demand," said Barnes. The Town of Penhold and the Central Alberta Regional Trail System (CARTS) are joining forces to create a trail system in Penhold as new residential areas are being developed. "The town has put together a request for grant funding from the National Trails Coalition (NTC) for a total of $325,000, which is 50 per cent of the estimated cost of $650,000 for the Penhold section," said Rick Binnendyk, the town's chief administrative officer. "We had Tagish Engineering put together an estimate for the 3,200-metre path through town which included cost of utility moves, design, engineering and build." He noted that the trail would create a walking path along the new residential development along the north and east of Highway 2A and connect with the existing Waskasoo Avenue system, and include a new path in the future Palisades division. "We fully support Penhold's grant application for a trail within the town," said Paul Pettypiece, president of CARTS, an organization that is promoting a trail system throughout Central Alberta. "It is a good time to build their trail with new land development coming along, and there is always the possibility of developer participation in the project." He noted that the Penhold trail design has the possibility of allowing Red Deer County's trail to connect easily with the urban system. "With the Penhold grant application, an answer could come before the end of 2014," said Pettypiece. "You just never know with grants of this nature. One condition of the grant is that the project must be completed before December 31, 2015." NTC is a government sponsored organization with both governmental and non-governmental fund sources whose mandate is to help build, develop and maintain trail systems across Canada. Further information on CARTS can be found at www.centralalbertatrails.org. Being the largest aquatic centre in Alberta isn't the Abbey Centre's only claim to fame. The facility also has the only indoor portion of the Trans Canada Trail (TCT) in the entire country. 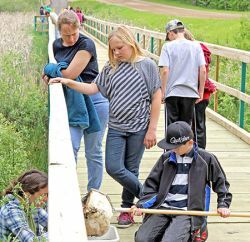 "It's amazing," said Debbie Olsen, past president of Central Alberta Regional Trails Society (CARTS) who was involved with the project from the start. This is the only indoor section of Trans Canada Trail in all of Canada, and as far as I know it will be the only indoor portion of the trail that spans thousands of kilometres, so it's pretty cool that here in Blackfalds we have the only indoor section. "Everyone I talked to thought it was really cool, and it is," she added. The TCT goes from Red Deer to Blackfalds through the Abbey Centre and north to Lacombe at Twp Rd 40-0. The town contracted Border Paving to pave the northern part of the trail for about $260,000. Putting a trail through the Abbey Centre seems like it would be a huge task but the biggest challenge was connecting to the centre, said Olsen. "The section that goes through Lacombe County (the committee) had to approach landowners, they had to get permits, there were regulations." But Central Alberta has been leading the pack when it comes to building trails in Alberta, said Olsen. "It speaks to what we've been doing here in Central Alberta. Blackfalds has a really young active population and we're building awesome facilities in terms of trails that people can use for years." Now that the trail is built and paved it's an asset to Central Alberta. "People can hop on their bike and ride from Red Deer to Lacombe and that's seriously cool," said Olsen. CARTS is a not-for-profit society that works with participating communities to build recreational trails throughout Central Alberta. The town is having a ribbon cutting ceremony Sept. 19 at 11 a.m. on the second floor of the Abbey Centre to officially open the TCT through the recreational facility. "I'm excited to see it," said Olsen. "I saw it when it was under construction. It's not just a hallway through a building. They put some boulders there and made it interesting." Picnics, bird watching, horseback riding, fishing, paddle boat cruising -- you name it. Waskasoo Park, Red Deer's great outdoor treasure, has it all and much more. Dave Matthews, Parks Planning and Technical Services supervisor for the City of Red Deer, says when people think about Waskasoo Park, they think about the more than 110 km of trails. But there's much more to discover on a hot summer day, including all the parks within the park, such as Heritage Ranch, Maskepetoon Park, Bower Ponds, Great Chief Park, Rotary Recreation Area, Three Mile Bend and Great West Adventure Park. The park stretches almost continuously along the Red Deer River banks from River Bend Golf Course and Recreation Area in the northeast to Fort Normandeau in the west, and along the two main tributaries of Waskasoo and Piper Creeks. It was more than 30 years ago that the province initiated an urban parks program, giving funds to municipalities to help develop parks. Red Deer received $23 million to develop the park system. As a result, Waskasoo Park quickly became one of the city's most valued assets and tourist attractions. Over the years, the park continued to be developed; playgrounds, picnic grounds, shelters, paved trails and community facilities were added. Many of the park's offerings -- such as Lions Campground, River Bend and Gaetz Lakes Sanctuary -- are connected by the winding trails such as the popular McKenzie Trails. 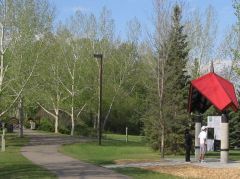 McKenzie Trails Recreation Area is in northeast Red Deer at the end of 45th Avenue. "Depending on where you go, there's always something different to see and something to experience," said Todd Nivens, Kerry Wood Nature Centre's program co-ordinator. "If you want high activity out in the bright sunshine and lots of noise and excitement, you have got Bower Ponds with the play park and the ball diamonds. If you want quiet, contemplative, cool refuge on a summer afternoon, you have Maskepetoon with its tamarack forests." The official opening of Maskepetoon Park, part of the overall park system, came in 2013. Located on the southwest side of Oriole Park, the lesser known gem was originally an undisturbed river valley that was bisected by Hwy 2 bypass in 1959. The development of the 75-acre park of forest and marshland took about four years, in order to preserve the ecology, do trail and boardwalk construction, vegetation reclamation and signage. Pedestrians can stroll along the paths and trails that wind through the forest and marshland. Nivens said there's an immense variety of things to do in Waskasoo Park on a summer or winter afternoon. But he said if you're looking forward to having a picnic, one of the best places is at Fort Normandeau, with its expansive fields and new picnic shelter, fire pits and tables. As an added bonus, all the exhibits in Fort Normandeau's interpretive centre were just re-opened this year after renovations over the winter. "For people who are looking to get off the beaten track, I honestly think Fort Normandeau is one of the places that people need to spend more time at," said Nivens. Nivens also noted that Waskasoo Park is accessible by foot, transit and vehicle. One of the popular spots on hot summer days is Discovery Canyon, accessible by foot across the Red Deer River footbridge north of Three Mile Bend off of Riverside Drive, or by vehicle to River Bend Golf and Recreation Area. Water-lovers can cool off in the natural river-fed pools of water on a hot summer day. Or stay closer to home and check out the city newly opened Blue Grass Sod Farm Central Spray and Play in the northwest corner of Rotary Recreation Park in downtown Red Deer. The Three Mile Bend Recreation Area, located on the North Bank Trail next to the Red Deer River off Riverside Drive at 76th Street, is a 55-hectare natural area that offers an off-leash dog park, a remote control car track, canoeing ponds and ski jump. "You could literally spend a day on a bicycle and have a dozen different experiences at half a dozen different park nodes and some of them can be as simple as sitting on the riverbank dangling your feet on the water to having a picnic in the park," said Nivens. "The beautiful thing about Waskasoo Park is that it's a fantastic way for people to disengage and really get in touch with the fact that Red Deer is a nature-based city. "We have this fantastic natural heritage that runs through the heart of the city. "If you really give the park some time and really take the chance to slow down and explore parts of it, people are really going to get a good appreciation for the whole speed of life in the park." In 2010, the city set in motion a plan to revitalize the identity of Waskasoo Park. Some of the signs were about 30 years old and were falling apart. The finishing touches on the new signage in Rotary Park, Kin Kanyon, Bower Ponds, Great West Adventure Park, Maskepetoon Park and Oxbows Off Leash Park were completed this year. For more information about Waskasoo Park and other outdoor amenities, go to reddeer.ca/recreation-and-culture. A new provincial initiative is aiming to improve existing recreational trails, but the infusion of cash will not help efforts to expand the local system. The province announced on Saturday -- International Trails Day -- that it was investing $1 million in a two-year pilot project that will bring together officials from governments provincial, municipal and rural with trail organization representatives to further develop infrastructure for existing trails. Along with the Alberta TrailNet Society, provincial snowmobile and off-highway vehicle associations will be involved in the Alberta Recreation and Trails Partnership. One local organization, the Central Alberta Regional Trails Society (CARTS), has been working to secure hiking/cycling trail linkages for the Trans Canada Trail in Central Alberta. Its current efforts mostly centre around extending the recreational trail system from Red Deer south to Bowden. The new provincial project intends to enhance trail signage and mapping, promote trails and identify trail enforcement issues. But the expansion and development of new recreation trails is "outside the scope" of the initiative. Paul Pettypiece, CARTS vice-president, said he does not expect the project will have a great effect on his group's efforts. CARTS is involved in a study to determine the best route for a trail between Red Deer and Springbrook, and is also pushing forward with a plan for a Springbrook-to-Penhold link. CARTS has had some good news in 2014, notably in February when Alberta Transportation reversed its opposition to trails being located near provincial highways. The move will allow CARTS to consider more potential routes in its plans for Penhold-to-Bowden and Red Deer-to-Sylvan Lake trails. Earlier this year, the federal government announced that it would partially match donations to the Trans Canada Trail Foundation, a fund that regional trail groups across the country can tap into to bankroll development projects. The foundation's goal is to have a continuous series of trails connecting all coasts by 2017. The partnership committee will also feature a representative from the tourism industry. Marathon runner Bill Nielsen operated under the belief that it is easier to ask forgiveness than seek permission, quietly and secretly blazing new trails where he and fellow runners could race and train. Metre by metre, those trails laid the foundation of the walking and hiking network in the City of Lacombe, cut and groomed by the hand of a retiree who, although small in stature, leaves a legacy far beyond his Central Alberta neighbourhood. "He was in so much hot water all the time," said Linda Nielsen of her husband, who died on Friday of pancreatic cancer after a head-on battle with Parkinson's disease. He was 73. Nielsen's trail building project was generally about six months ahead of local officials, reaching 20 km altogether. At one point, he had to negotiate an agreement with a private developer because each was moving the ribbons the other had set out to mark a route, said Linda. When officials from what was then the Town of Lacombe finally caught up with Nielsen and challenged him, he changed gears and joined the parks and recreation board, serving for eight years in total, including a stint as chair. Every metre of those trails has since been incorporated in city's trail system, his wife said. Egged on by his son, Bill Jr., Nielsen ran his first marathon at the age of 40 -- and swore after nearly collapsing toward the end that he would never run another. Five years later, he ran his fastest time ever, finishing in two hours and 48 minutes -- six minutes ahead of his son. "We had no place to play in the centre of (Montreal); our playgrounds were big department stores, roof tops and McGill campus. We would get chased out of all these places by the security guards, so you had to run fast because if they caught you, they would turn you over to the police. I learned to run fast." Nielsen completed his 50th marathon in 1997. "I said, that was easy, I can do 100," he said in an interview with the Advocate. He was two-thirds of the way there, with 35 marathons to go, when he was diagnosed with Parkinson's. But there was no quit in him. Instead of shutting down, he forged ahead, convinced that running and training would fend off the effects of the disease. He ran his last 10 marathons over the space of one year, reaching his goal in the Woody's RV World Marathon in Red Deer in May 2008, at the age of 68. Nielsen had helped found the Red Deer marathon in the late-1990s and had been its chair for eight years. A fellow runner once described Nielsen's gait during his last marathons as so awkward, it was hard to watch. He was wearing the toes out of the left shoes at an extraordinary speed because the left leg was dragging due his Parkinson's, so he would need a new pair of shoes for each marathon, said Linda. A running store provided him with new shoes for each of his last five marathons. He had to stop running shortly after Woody's, but joined fellow runners by riding with them on a bicycle, said Bill Jr.
Named Alberta Volunteer of the Year in 1998, Nielsen is to be inducted posthumously in June to the Wood Buffalo Sports Hall of Fame in Fort McMurray, where he lived and worked before retiring to Lacombe in 1996. Linda will accept the award on his behalf, along with his two daughters, Karen and Tracy. Linda is now looking for a place where the many mementoes of Nielsen's exploits, including all of his medals and 11 scrapbooks, can be displayed in public. Nielsen was diagnosed with cancer early in December, while he and Linda were at their winter home in Mesa, Arizona. He spent the last month of his life at the Red Deer Hospice, where he was visited by streams of people, including the many runners he had inspired. He would not allow anyone to be turned away, said Linda. A memorial service is set for 11 am on Saturday at the Lacombe Memorial Centre -- a project Nielsen worked on firsthand as a member of its planning committee. Red Deer County and Central Alberta Regional Trail Society (CARTS) have taken one more step towards a Red Deer to Bowden and Sylvan Lake trail. Red Deer County recently passed a motion to apply for Alberta TrailNet funding for a consultant study examining the Red Deer to Springbrook trail, which could possibly include the Mintlaw Bridge. The request also included participation in meetings with Penhold, Bowden and Sylvan Lake. "I am very excited that the county has taken this step in support of the trail," said CARTS vice-president Paul Pettypiece. Other developments for the Red Deer to Bowden trail system include a reversal of Alberta Transportation's stance on regional trails parallel to highways where possible and the offer of land north of Highway 592 for the Penhold portion of the trail. "This is a big step forward," said Pettypiece. "Their cooperation for the Trans Canada Trail is vital to its completion. Offering land alongside main roads will make the trail system more safe and far easier and less expensive to build." He noted the offer of land north of Highway 592 which is owned by the Town of Penhold presently will make them (Penhold) eligible for Trans Canada Trail funding. The trail could be placed in the ditch but negotiations will be forthcoming. There is the issue of where the trail will come from Red Deer as well, with the historic Mintlaw Bridge being an option for inclusion in the regional system. "With the possibility of the Mintlaw trestle being included several funding options open up," said Pettypiece. "It is an expensive path but funds might be accessed from Alberta Tourism and up to 50 per cent of the project will be granted. There is some resistance from landowners on the idea though." He added funding would be harder to come by if the trestle is not included in the trail. "The old Alberta Central Railway right-of-way is owned by Red Deer County and this would make the pathway easier again to complete," said Pettypiece. Pettypiece said there are a couple of other factors in the trestle being more attractive as part of the trail. "This is a historic landmark that stands as a reminder of Central Alberta's railway history, and the fact that it was designed by Michael Dawe's grandfather is significant as well," he said. "It is an amazing site that the county has done some repairs on this year as well, indicating the county sees value in the trestle." The 24,000-kilometre Trans Canada Trail system has been envisioned to be completed by 2017 celebrating Canada at 150. Alberta TrailNet Society is Alberta's provincial trail council formed to support the ongoing development of the Wild Rose Trail System and the 2,987 km of the Trans Canada Trail. Good news indeed that Alberta Transportation changed its mind and will support shared-use trails along selected highways. I have always wondered, as I pedalled along some rather narrow highway shoulders, heavy trucks whizzing past me at close range, why building a bike trail across the ditch closer to the fence lines should be opposed on the grounds they're not safe. Likewise, it's good news that the federal government will chip in a dollar for every two dollars that local groups can raise to build and maintain these off-highway links between communities. This truly is a case of build-it-and-they-will-come. Not to mention becoming a fitness, recreation and tourism legacy for the future. The website for the Trans Canada Trail says its ongoing trails building project is about 72 per cent complete. Some 17,000 km of trails, linking hundreds of communities all across Canada, have already been built and are in use. The entire 24,000 (km) system is being planned for completion by 2017, but much of the remaining 6,500 km that would fill gaps in the network coast-to-coast will be the most difficult sections to build. There's still a lot of work to do. Because Alberta has a long north-south section as well as an east-west section, we have the largest provincial portion of trail to complete. It's not hard to see why Alberta also has the smallest percentage of its trail network finished. That's part of the reason the announcement on Tuesday by Alberta Transportation not to oppose trail building along selected routes that follow highways is such a good thing. First, it lowers costs tremendously. The routes are already in place, and no private land needs to be ceded or purchased by groups like the Central Alberta Regional Trails Society. And, for a cyclist planning a day-long or weekend spin to a nearby town, the route is already obvious on a map. Right now, the society is working hard to get a trail link from Red Deer to Springbrook. That would be a really nice afternoon ride for a recreational cyclist, but more importantly it would be a safe route for commuters who live in one community but work in the other. The ability to ride from Springbrook to Red Deer and back is not the barrier many non-cyclists think it might be. The perception of safety is. Hwy 2A is a nice stretch of road, with a broad shoulder, but it is also always heavy with traffic. In my experience, you ride it because it's the only link to someplace that's much nicer to ride. Similarly, the route from Penhold to Innisfail goes through some very nice terrain. A lot more people would ride or hike the route, if they could feel safe. Drivers on Hwy 2A would also feel a lot more safe, not having to encroach the oncoming traffic lane while they pass a cyclist (or a group of cyclists). One of my personal favourite day-trips begins in Benalto, with lunch at either Spruce View or Markerville. It's a lovely ride on very good roads, with not a lot of traffic. If there was a safe link between Red Deer and Sylvan Lake (which would have to include safe passage across Hwy 2), that ride would become an epic loop, partly on trails, partly on secondary roads. For me, that would involve a lot more Sunday lunches. Include trail links from Bowden to Red Deer (the longer-term plan being proposed), and now you're talking tourism and bed-and-breakfasts. Think safe, pleasant trail links from Bowden all the way to Wetaskiwin and Pigeon Lake -- all supported by local volunteer groups -- and you're thinking of a tourism resource that can add real value to local economies. Consider Rocky Mountain House, with a wilderness trail all the way to Nordegg, and you're thinking return visitors. Europe is totally crisscrossed with these trails, beside highways and rail lines, following rivers, crossing farmlands. I've ridden well over 1,000 km of them over the years. I know people in Europe who would be thrilled to consider a bike trip through Western Canada. Time a trip with a local rodeo, fair or music festival and you've got yourself a destination for visitors who would happily pay for the experience. Our easy access to the Rockies puts these experiences in closer contact each year with millions of visitors, who could be lured into a side adventure. All it takes is that people in authority say yes to the idea. Like Alberta Transportation Minister Wayne Drysdale did on Tuesday. Make it safe, make it pleasant, make it fully-connected and easy to find, and I believe people will be truly surprised at how quickly it grows in popularity. Greg Neiman is a retired Advocate editor. Follow his blog at readersadvocate.blogspot.ca or email greg.neiman.blog@gmail.com. Neiman is also president of the Red Deer Association for Bicycle Commuting, a group that advocates for a more bike-friendly region. Those who have doggedly sought to link Central Alberta communities with trails have a new spring in their step. The Central Alberta Regional Trails Society has been getting some good news lately. Last month, Prime Minister Stephen Harper announced the government would commit $1 for every $2 raised through public contributions to the Trans Canada Trail Foundation, which wants to create an unbroken 24,000-km national chain of trails by 2017. In Alberta, a significant obstacle to trail building was removed when Alberta Transportation reversed its opposition to locating trails near provincial highways, which had long hindered route selections. "It's a 180-degree turnaround, so we're ecstatic," said Paul Pettypiece, trails society vice-president. "It gives us a lot more options. Especially from Penhold to Bowden, it opens up possibilities that weren't there before." Alberta Transportation has even asked to join the trails society. Pettypiece believes the province changed its stance because it realized if trails weren't allowed along obvious routes, people would use busy roads and their shoulders anyway, creating a bigger danger than allowing a nearby trail. On Tuesday, the trails society won another small victory when Red Deer County council agreed to a request to forward an application on its behalf for $35,000 in funding to hire a consultant to study potential routes. A link from Springbrook to Red Deer is project No. 1, and the consultant will also look into whether the historic Mintlaw railway bridge south of Red Deer could be incorporated into a trail. It would prove a spectacular attraction for trail users. Council also agreed to send county representatives to sit in on meetings with area municipalities to discuss Red Deer-to-Sylvan Lake, Springbrook-to-Penhold and Penhold-to-Bowden links. The Town of Blackfalds is set to put the final link in the chain. In the 2008 Facility and Parks Needs Assessment, town officials made connecting to the Trans Canada Trail (TCT) a priority and after acquiring and subdividing the final piece of land their goal is in sight. During their Jan. 14 meeting, Blackfalds town council unanimously approved the subdivision of lands acquired from an area resident to link into the TCT as it heads north to Lacombe. "This will link the Trans Canada Trail to the north at Township Rd. 40-0 and we will build a trail down part of Broadway Ave. and down the proposed right of way and into Aurora Heights, which would link into the trail in town," said Terry Topolnitsky, Planning and Development Officer. Although the plan is to complete and pave the section of the trail north of the town this year, at the present time the trail would not be 100 per cent complete. The final stretch of trail will run through several developments in progress and connect into the town's trail system further south. "We're trying to get Aurora (Heights) and Aspen (Lakes) done this year, but I have to work with the developer west of the area," said Sean Barnes, Director of Community Services. "He still hasn't given approval to build a trail there yet. That may be done in 2015." Now that the required land is subdivided, the town can register the title and complete its purchase with Frank Kuhnen, who officials say has been very supportive of the helping complete the trail. 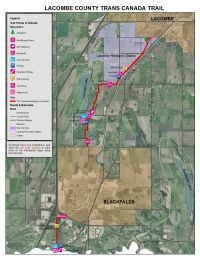 Blackfalds Town Council awarded the paving of the northern section of the trail to Border Paving for about $260,000 and the contractor expects to complete the project in May. Now that the end is in sight, Mayor Melodie Stol said the excitement is beginning to build and will make using the trails that much safer. "Once it's completed we are going to be so excited and knowing Blackfalds has the only indoor-outdoor link of the Trans Canada Trail in the Abbey Centre is great," she said. "It will be great for users to have a safe and paved trail through the community." Contributions to the Trans Canada Trail Foundation will go a little further from now on as the federal government aims to have an unbroken national chain of recreational trails go as far as Canada's three oceans by 2017. After walking on a segment of the trail in rainy Victoria on Tuesday, Prime Minister Stephen Harper made the announcement that the government would commit one dollar to the project for every two dollars raised through public contributions by the Trans Canada Trail Foundation. The federal funding limit for the donation matching program is $25 million over four years. A government release said the trail will help connect Canadians to nature, provide health benefits and inspiration, and generate millions in economic benefits. The trail project began in 1992, as part of Canada's 125th birthday celebrations. The goal is to complete it from the Atlantic to the Pacific and Arctic oceans by 2017 to coincide with Canada's 150th anniversary. Nearly 17,000 km of trail is already operational across the country, with the end result expected to cover 24,000 km. Alberta trails other provinces when it comes to Trans Canada Trail development, with many segments of trail completed but missing connecting linkages. In Central Alberta, there is a trail connection between Red Deer and Lacombe, with the Blackfalds to Lacombe section having opened in 2013. Plans are in place for sections reaching from Ponoka to Bowden, with county governments on board with trail proposals but concerned about the costs they could incur. Thus, said Central Alberta Regional Trails Society vice-president Paul Pettypiece, increased government funding could give those projects the needed push. "It is excellent news because there are a lot of trail projects in Central Alberta that need completing," said Pettypiece. Lacombe County has plans to bring the trail from its current endpoint near its northern boundary to Lacombe. Trails between Red Deer and Penhold are in the works and a concept plan for trails connecting Penhold to Innisfail and Bowden has been considered by Red Deer County council and town councils along the route. Capital development costs for a Penhold to Bowden trail could range from $29,800 for a crude trail to over $6 million for a fully-developed track, according to the concept plan. "I certainly think it's possible to complete the links (by 2017). It's not a sure thing by any means but it's certainly possible," said Pettypiece, "From Bowden south, that's a little trickier. I can't see that being completed, but who knows? If there's enough money, anything's possible." When Blackfalds' Abbey Centre multi-purpose facility opens in March, it will feature what Pettypiece believes will be the only indoor stretch of the trail. Designed to accommodate activities such as hiking, cycling, horseback-riding, cross-country skiing, snowmobiling and canoeing, the part land, part water national trail will be one of the longest recreational trail networks in the world. Municipalities or regional/provincial trail groups can apply to the Trans Canada Trail Foundation for funding to complete a stretch of the trail and provide trail maintenance. For more information, visit www.tctrail.ca.